The Cherry Adjustable Standing Desk with Owl Perch addresses all postural possibilities for maintaining healthy dynamics while working for long periods of time. Health experts recommend changing positions frequently. The Owl Ergonomic Cherry Workstation is an Owl Perch, adjustable from 20″ – 30″ and the Owl Adjustable Standing Desk (available in 3 heights). A lumbar support may also be added for extra postural support. Please call us if you have questions or if you need help with a selection, 207-367-6555. Owl Adjustable Standing Desk (3 height options – adjustable from 26″to 36″, 30″ to 40″ or 34″ to 44″). We also offer a tilt feature which allows a 40 degree tilt from a flat surface and a footring is available with the tallest height desk. The Cherry Adjustable Standing Desk is available with a round or rectangular desk top. Choose between Silver Moon or Night Owl Black metal bases. Owl Perch is available with a Classic or Pro seat. Learn the difference between Pro Owl and Classic Owl seats. The Walnut Adjustable Standing Desk with Owl Perch addresses all postural possibilities for maintaining healthy dynamics while working for long periods of time. Health experts recommend changing positions frequently. 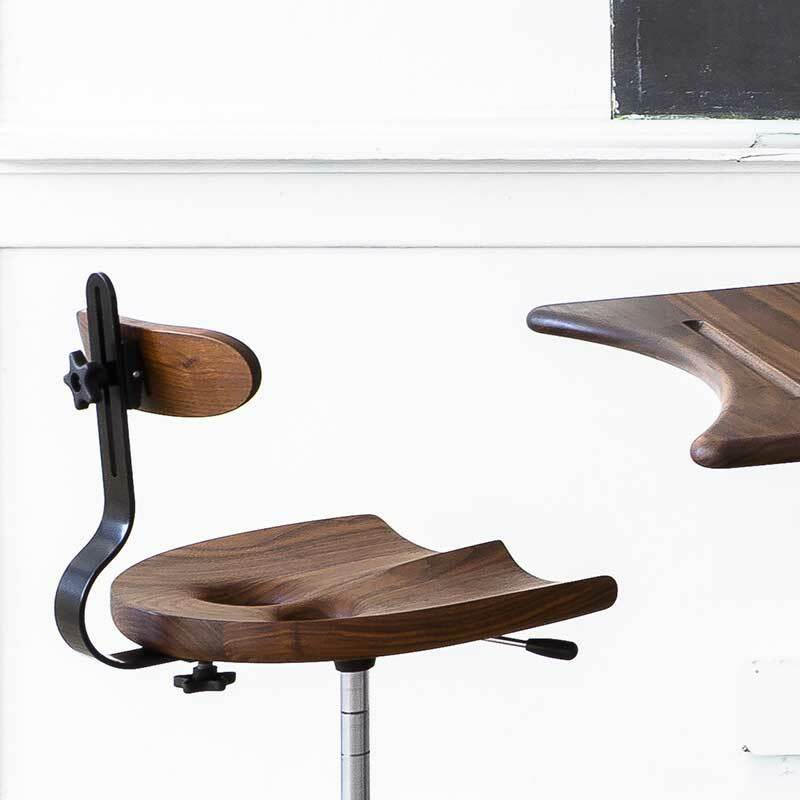 The Owl Ergonomic Walnut Workstation is an Owl Perch, adjustable from 20″ – 30″ and the Owl Adjustable Standing Desk. Owl Adjustable Standing Desk (3 height options – adjustable from 26″-36″, 30″- 40″ or 34″- 44″). We also offer a tilt feature which allows a 40 degree tilt from a flat surface and a footring is available with the tallest height desk. The Walnut Adjustable Standing Desk is available with a round or rectangular desk top. Choose between Silver Moon or Night Owl Black metal bases. Owl Perch is available with a Classic or Pro seat. Learn the difference between Pro Owl and Classic Owl seats. The Owl Walnut Standing Desk is made of 1” thick, sustainably harvested walnut and measures 32″ wide by 26″ deep. The desk is available in two organic shapes with comfortable rounded edges. A cup holder and pencil tray are built into every Owl Standing Desk. The durable metal base adjusts from 26” to 44” (3 height options available) and comes in a black semi-gloss powder coat finish or polished aluminum finish. An optional foot ring can be added to the tallest height desk for added sitting or standing comfort. We also offer a tilt feature for the Owl Standing Desk, which allows a 40 degree tilt from a flat surface. The beautiful tung oil finished walnut desktop and contemporary base offers ease of adjustment and mobility, and partners perfectly with either the Classic Rolling Owl Stool or Pro Rolling Owl Stool, and at a taller height with the Classic Owl Perch, Pro owl perch or as a standing workstation. More than a desk – It’s an Up/Down Ergo Experience! Volume Discounts Available! Contact us for more information. The Owl Cherry Standing Desk is made of 1” thick, sustainably harvested cherry and measures 32″ wide by 26″ deep. The desk is available in two organic shapes with comfortable rounded edges. A cup holder and pencil tray are built into every Owl Standing Desk. The durable metal base adjusts from 26” to 44” (3 height options available) and comes in a black semigloss powder coat finish or polished aluminum finish. An optional foot ring can be added to the tallest height desk for added sitting or standing comfort. We also offer a tilt feature which allows a 40 degree tilt from a flat surface. The beautiful tung oil finished cherry desk top and contemporary base offers ease of adjustment and mobility, and partners perfectly with either the Classic Rolling Owl Stool or Pro Rolling Owl Stool, and at a taller height with the Classic Owl Perch, Pro Owl Perch or as a standing workstation. The Lumbar Support Accessory is designed to attach to a Pro or Classic rolling Owl, Perch or 4 Legged Owl Stool and provides gentle lumbar support when adjusted properly. The adjustments allow it to move up and down and in and out to accommodate a variety of different body sizes. It is offered in either Cherry or Walnut wood and the metal portion in Night Owl Black or Silver Moon. Our adjustable Footring provides leg support and varied postures while sitting or standing at an Owl Stool Desk. The Footring can be added to the tallest Owl Standing Desk (34”-44”) and has is a durable silver chrome ring with black powder coated spokes. Move around freely on your Owl Metal Base Stool! Our duel soft tread casters provide a smooth ride on hard floors and low pile carpet. The non-marking rubber coating is safe for hardwood floors. Rolling Casters come in a set of five for Owl Metal Base Stools. Replacement Rolling Casters can be ordered individually. Stationary Feet come in a set of five for Owl Metal Base Stools. Replacement Stationary Feet can be ordered individually. Our handcrafted Pro 4 Legged Owl® Bar Stool, features our patented Pro Owl Seat, was originally designed with health practitioners in mind. It offers rounded and sloping front corners for increased lateral leg mobility, and a smaller footprint than the original 4 legged classic design, making it the perfect ergonomic seat for anyone who needs a range of motion when seated. Available in heights from 25″ to 32″ so whether you’re looking for seating for a bar, a high table, or work surface you’ll find the perfect ergonomic, wooden stool. Sleek and modern, it adds natural beauty to any setting. Owl’s unique postural support holes help relieve back and sciatic pain by easing spine tension and sitting pressures. 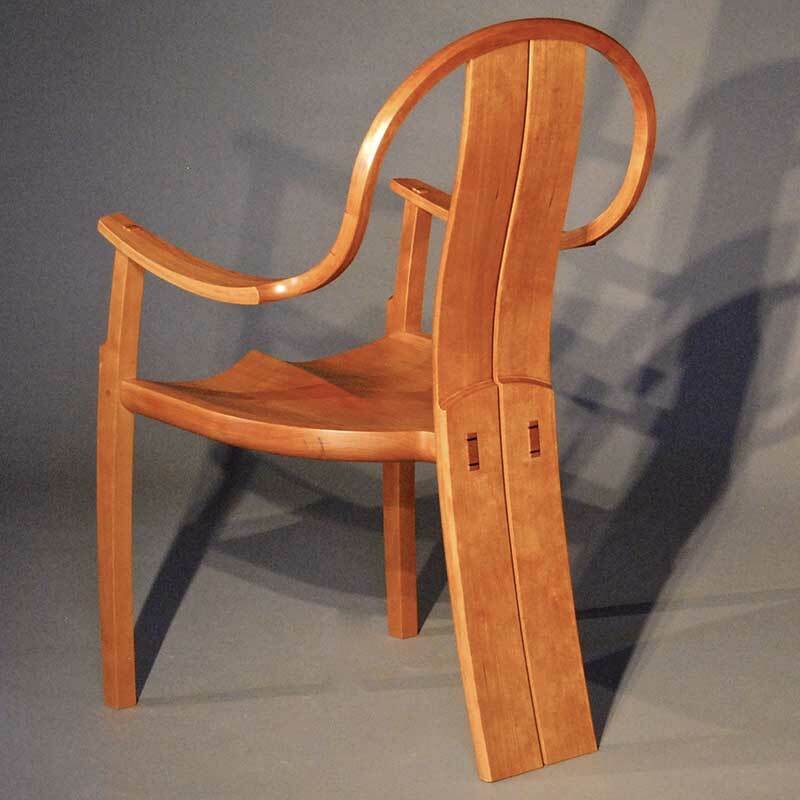 The curved sculpted seat with a hand rubbed tung oil finish emphasizes the natural beauty in the grain of every seat and is made from sustainable eastern American cherry. We have a growing list of customers who have experienced pain relief as a result of the Owl Stool’s unique postural support design. Check out our Ergonomics page for an in-depth look at what makes the design of the Owl Stool so comfortable and unique. The Owl Bar Stool is also available with a Classic Owl seat. The Pro 4 Legged Owl Kitchen Stool, featuring our patented Pro Owl Seat, was originally designed with health practitioners in mind. It offers rounded and sloping front corners for increased lateral leg mobility, and a smaller footprint than the original Classic 4 Legged design, making it the perfect ergonomic seat for anyone who needs a range of motion when seated. At 24″ in height, the Pro 4 Legged Owl Kitchen Stool is the perfect height for a kitchen counter, workstation, or drafting table. Beautifully handcrafted with a natural Cherry hardwood seat, this is not your ordinary kitchen stool – smooth edges and asloped seat make it the most comfortable stool around. We have a growing list of customers who have experienced pain relief as a result of the Owl Stool’s unique postural support design. Check out our Ergonomics page for an in-depth look at what makes the design of the Owl Stool so comfortable and unique. The Pro 4 Legged Owl Kitchen Stool is handcrafted with a natural Cherry wood seat and legs of Ash and is 24″ in height. The seats measure 17” wide by 15” deep. For 18″ stools see the Pro 4 Legged Owl Stool. For stools 25″ – 32” in height see Pro 4 Legged Owl Bar Stool. The Owl Kitchen Stool is also available with a Classic Owl seat. Learn the difference between Pro Owl and Classic Owl seats. The Pro 4 Legged Owl® Stool, featuring our patented Pro Owl Seat, was originally designed with health practitioners in mind. It offers rounded and sloping front corners for increased lateral leg mobility, and a smaller footprint than the original 4 legged classic design, making it the perfect ergonomic seat for anyone who needs a range of motion when seated. Owls unique postural support holes help relieve back and sciatic pain by easing spine tension and sitting pressures. The curved sculpted seat emphasizes the natural beauty in the grain of every seat and is made form sustainable eastern American cherry. The Pro 4 Legged Owl Stool makes a lovely desk or dining chair, and is perfect for sitting at a kitchen counter. 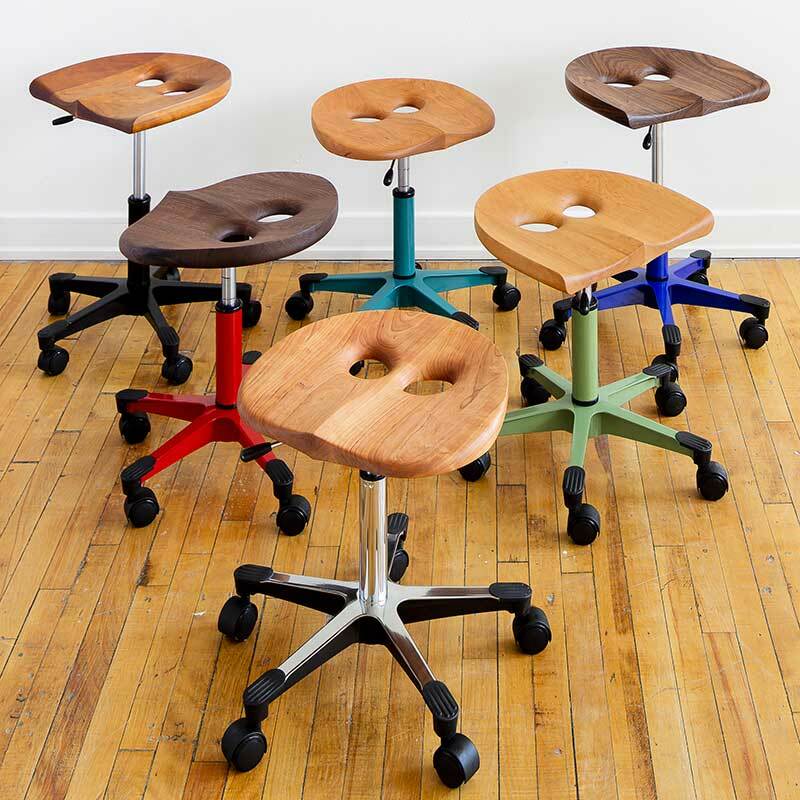 Whether you’re playing music, working at the computer, or drawing at a drafting table, you’re sure to enjoy the Owl Stool’s unique comfort and pleasing design. Our solid wood Owl Stools come with Cherry seats and legs of Ash available in 18″ and 24″ heights. The seats measure 17” wide by 15” deep. The Owl 4 Legged Stool is also available with a Classic Owl seat. The Classic Owl® Perch is a taller version of our classic rolling owl stool. 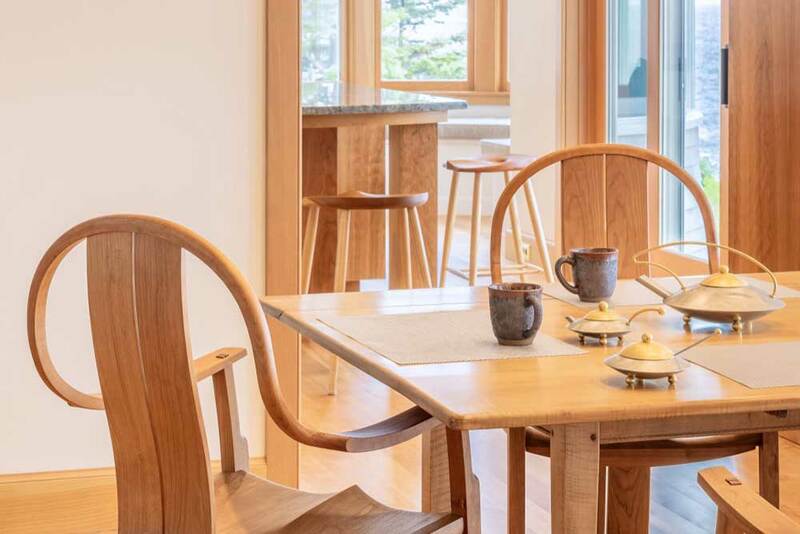 It features a classic seat that provides added support for the legs and hips with up-sloped sides and a con-caved support system at the front of the stool. The postural support holes relieve back pain by easing spine tension and sitting pressures. The sturdy, cast aluminum base adjusts from 20″ to 30″. 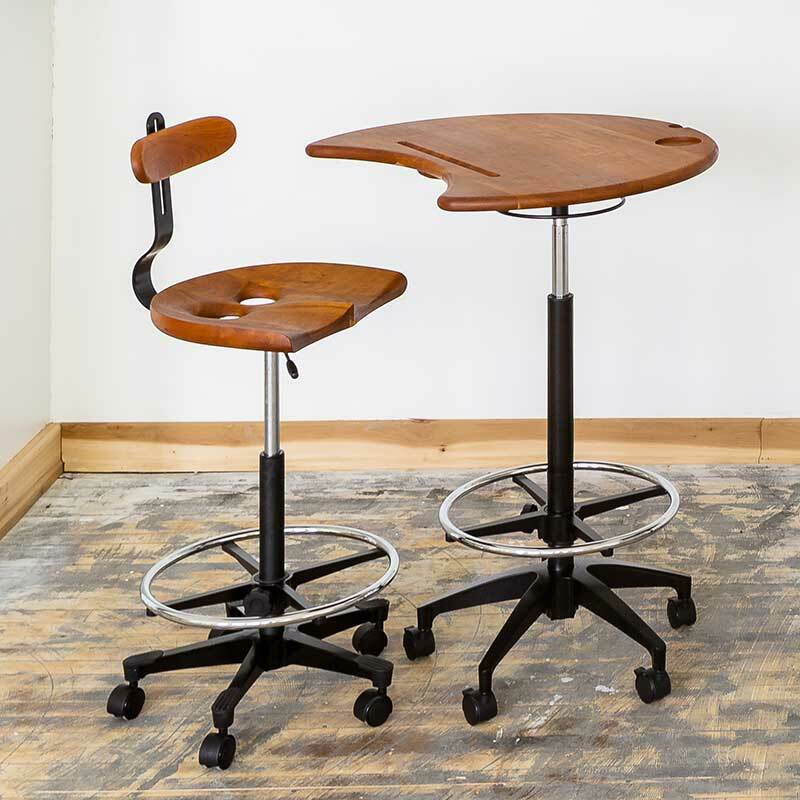 At its highest it adapts perfectly as a standard height bar stool, drafting table or at our Owl Standing Desk and at the lowest height it still fits comfortably at a desk. A lumbar accessory can be added for additional comfort and support. The base also features an adjustable circular footrest. The Classic Owl® Perch offers the same ergonomic benefits as our other Owl stools. The Classic Owl® Perch bases are available in two colors, Silver Moon and Night Owl Black. The seat is available in either Cherry or Walnut. Choose between stationary feet or non-marring polymer rolling casters. Add $50.00 per stool if Walnut seats are included and $235 for lumbar supports. The Perch is also available with a Pro Owl seat. The OM Meditation Stool is a comfortable and aesthetic solution designed to meet the needs of meditators who have limited flexibility. It provides all the postural benefits of the Owl Stool by removing pressure from the sit bones and the lower spine, supporting optimal spinal alignment. We offer the OM in rich, natural Cherry with Ash legs. It features rounded front corners for greater comfort while sitting with crossed legs. The OM Stool slopes 2″, from 10″ high in the back to 8″ in the front, however it can be ordered in any height from 18″ down to 1.5″ off the floor. If you have questions about the best height for you please give us a call. The Owl Bar Stool is a perfect solution for your bar. Sleek and modern, with a graceful presence, it blurs the lines between furniture, art and fun! The silky feeling of the hand-finished hardwood seat is a joy to touch and as beautiful as it is functional. The seat is sculpted to emphasize the natural beauty of the wood and with contoured sides it adds more support for the hips and thighs. Plus, you will find them a breeze to move around using the holes as a convenient handle. Check out the Ergonomics page for an in-depth look at what makes the design of the Owl Stool so comfortable and unique. The Owl Bar Stool is offered in sustainably harvested cherry and the seat measures 17” wide by 15” deep. It is offered in heights of 25″ to 32″. Generally the stool should measure 12″ below the top of your work surface. If you need help deciding which height is best for you please call or email and we will help. The Owl Bar Stool is also available with a Pro Owl seat. The perfect kitchen stool is also good for you! Meet the Classic Classic Owl® Kitchen Stool- this isn’t your ordinary kitchen chair. This uncommonly comfortable stool is handcrafted here in Maine for maximum ergonomic comfort. We designed it to help relieve back pain by easing spine tension and sitting pressures. The seat is sculpted to emphasize the natural beauty of the wood and with contoured sides it adds more support for the hips and thighs. Check out our growing list of customers who are experiencing significant pain relief as a result of the Owl Stool’s unique ergonomic design. Whether you’re at the kitchen counter or the drafting table, you’re sure to enjoy the Owl Stool’s unique comfort and sculptural design. Visit the Ergonomics page for an in-depth look at what makes the design of the Owl Stool so comfortable and unique. “Don’t think stool. This is an ergonomically designed, doctor evaluated postural support, which eases both spine tension and sitting pressures. An aesthetic balance has been struck between beautiful form and healthy spinal support.” Visit the Ergonomics page for an in-depth look at what makes the design of the Owl Stool so comfortable and unique. Our all wood Owl Kitchen Stools are 24″ high with a natural hardwood Cherry seat which measures 17″ wide and 15″ deep. The kitchen stool fits perfectly under any standard kitchen counter. Please feel free to call or email us if you need help figuring out how high your stools should be. The stool should stand about 12″ lower than the surface of the table or counter where it is to be used. 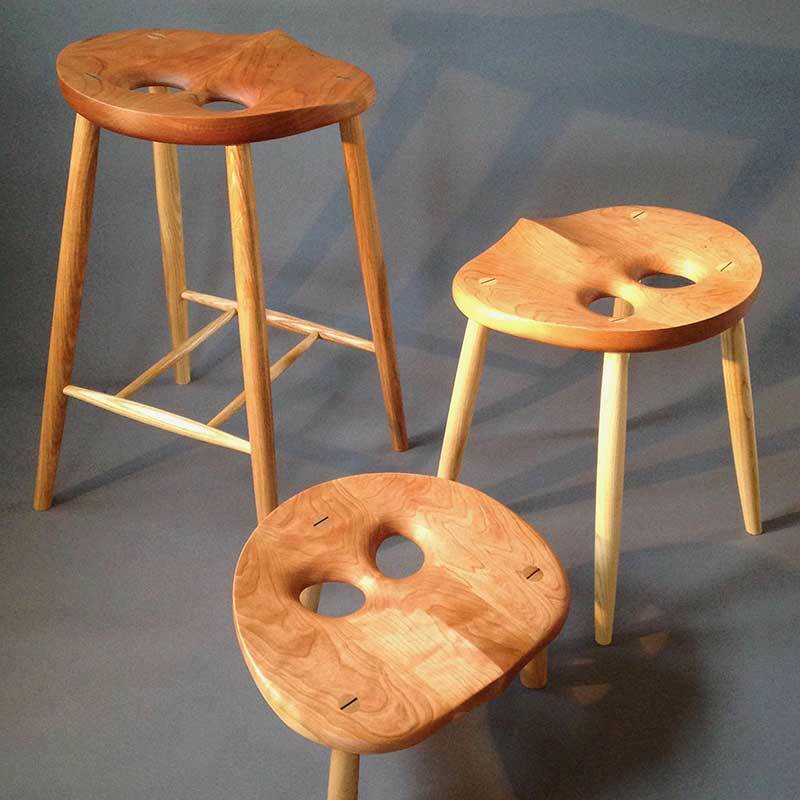 Other 4 legged stool heights are available. For 18″ and 24″ heights, see our 4 Legged Classic Owl Stool. For heights between 25″ – 32″, see our Bar Stools. The Owl Kitchen Stool is also available with a Pro Owl seat. The 4 Legged Classic Owl® Stool is handcrafted for maximum ergonomic comfort. It is designed to help relieve back pain by easing spine tension and sitting pressures. The seat is sculpted to emphasize the natural beauty of the wood and with contoured sides it adds more support for the hips and thighs. The Owl Stool makes a lovely desk or dining chair. Whether you’re playing music, working at the computer, drawing at a drafting table or looking for a kitchen stool or bar stool, you’re sure to enjoy the Owl Stool’s unique comfort and pleasing design. We have a growing list of customers who have experienced pain relief as a result of the Owl Stool’s unique postural support design. Check out the Ergonomics page for an in-depth look at what makes the design of the Owl Stool so comfortable and unique. 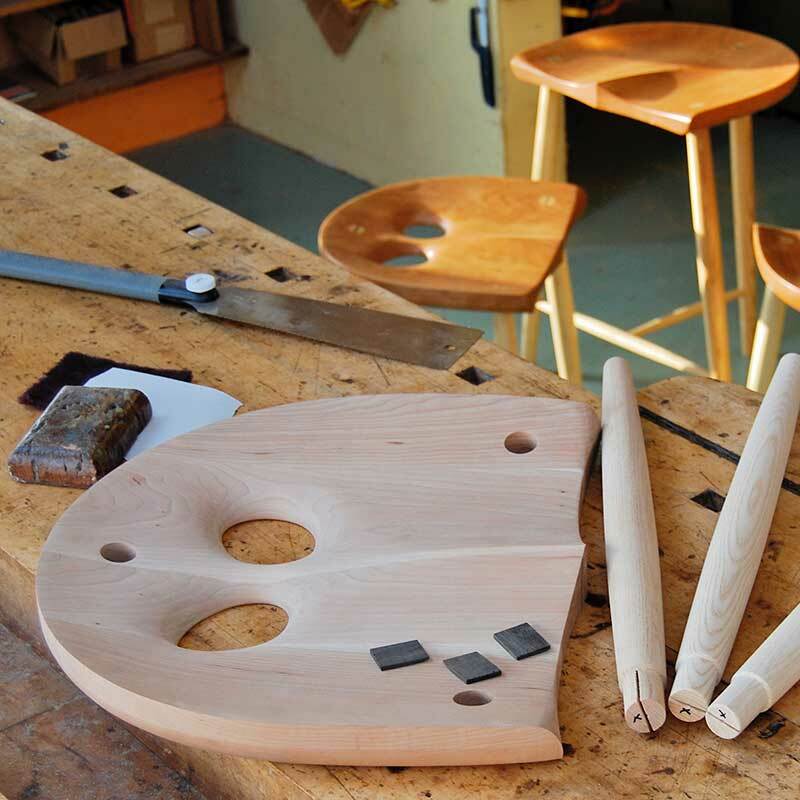 We also offer kits that you can assemble at home or at one of our workshops. The Owl 4 Legged Stool is also available with a Pro Owl seat.